Grandpa remembers many things from long ago, but he has trouble remembering his granddaughter, Georgia. In this moving story, a little girl helps her grandfather reach his memories through the simple act of making hats from folded newspaper. A gentle yet powerful story about the love and memories that bind families together. I had heard Phil tell this story before it was a book, more than once, and it made me cry…more than once. I even told the story to other people and it made them cry, so consider yourself forewarned. In saying that, I know many people who have read this books and didn’t cry, and like it is with many picture books, we often see our own stories within the pages, and different stories mean different things to different people. That there is the beauty and magic of a picture book. So…why is it so sad? It’s the story of a little girl visiting her Grandpa in a nursing home. 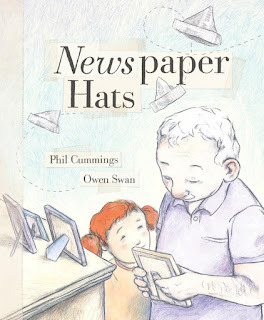 On her way there she asks her Dad, ‘Will Grandpa remember me today?’ When she gets to Grandpa’s room she asks ‘…do you remember me?’ Grandpa doesn’t remember Georgie, but he remembers lots of other things about his life, his childhood, the war, and he remembers how to make newspaper hats. He loves making newspaper hats…so that is what he and Georgie do. This is a gentle story, that will touch the heart of anyone who has/has had a loved one whose memories are sometimes just out of their reach. You know I love endpapers, and in this book Owen Swan has recreated the covers of real Australian newspaper headlines. And if you look closely at the page where they are making newspaper hats you will see that there are headlines on those newspapers too.